Bench grinders may not be as versatile as angle grinders but are ideal for sharpen cutting tools, to smooth sharp and rough edges on cut metals. Typically bench grinders have two wheels, one either end, of different grades to give different finishes - possibly a 36 Grit wheel and 60 Grit wheel. Some bench grinders have both a wet and dry wheel, this adds versatility. Various sizes of wheels are available, typically 6 or 8 inch - always use the correct sized wheel for the grinder. If the grinding wheels becomes worn unevenly, it can be 'dressed' using a dressing tool. 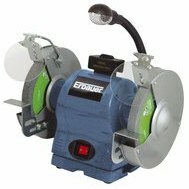 Typically wattage range from 250 to over 370 watts - the higher the wattage, the more powerful the grinder will be. The tool rests - they need to be firmly mounted and adjustable. Adjustable Eye Shields to allow adjustment for access to the wheels. A worklight can be an advantage. A dust protected On/off switch - mounted where it can easily be reached but not that it can be accidentally knocked on. Wall chasers are probably too expensive to be justified for the ordinary diy'er but make life easy for the professional plumber or electrician. It may be possible for a diy'er to hire a wall chaser for the times one is needed. All you need to do is set the width and depth of the blades (typically Diamond Blades) and running the chaser up or along a wall will put two parallel cuts into brick, plaster, cement and similar building materials which can then be easily chopped out to accommodate cable trunking, pipes etc. Different models offer different ranges of cutting width (such as 3-30mm or 9-40mm) and depth (such as 6-30mm or 20-65mm) - so each model is somewhat restricted it what it can do. A dust extraction facility on the wall chaser is almost a necessity as considerable masonry dust may be created in use. Wall chasers are available to operate on 110 or 230 volts AC - the 110 volt ones are intended to be used with a step down transformer for added safety on work sites. Grinders can be very useful power tools but need to be treated with respect as the spinning abrasive discs are potentially very dangerous. Hand held grinders should never be put down until the disc has come to a complete stop. When using any type of grinder, a face mask, ear defenders, gloves and eye protection may be necessary - it will depend upon the type of grinder and the material being worked upon. Care must be taken when cutting or grinding metal, since the grinder will produce large amounts of sparks. These may not only be painful on your skin, but may also present a fire hazard should they fall onto anything flammable. When cutting or grinding masonry a lot of dust will be produced. Even when working out of doors, you can find yourself working in a thick dust cloud - this may be reduced on a windy day but the dust will just be carried to the surrounding area. So always use a face mask and wear old clothes.